Chamber Music at the Clark concert seating is determined via lottery. The booking-by-lottery entry form for Shanghai Quartet concert seats posts here on Thursday, November 15, 2018. Lottery registration closes Thursday, December 6, 2018. 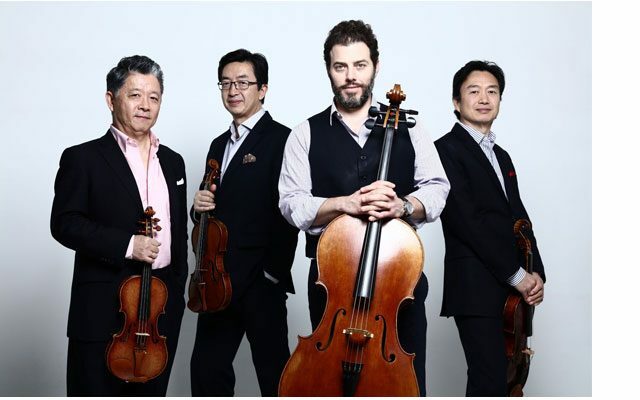 Renowned for its passionate musicality, impressive technique, and innovation, the Shanghai Quartet is one of the world’s foremost chamber ensembles. Its elegant style melds Eastern music with Western repertoire, traversing musical genres from folk music, to great masterpieces, to cutting-edge contemporary works. Formed in 1983, the Quartet tours the major music centers of Europe, North America, and Asia. Appearances include the Beijing International Music Festival, the Festival Pablo Casals in France and Puerto Rico, and the Beethoven Festival in Poland. The Quartet has appeared at Carnegie Hall and Lincoln Center. They have collaborated with the Tokyo, Juilliard, and Guarneri Quartets, and with Yo-Yo Ma, Menahem Pressler, Yuja Wang, Peter Serkin, Jean-Yves Thibaudet, and Wu Man. They perform regularly at North America’s leading chamber music festivals. The Quartet has a history of championing new music. Its 30th anniversary brought new works from David Del Tredici, Carl Vine, Jeajoon Ryu, Lei Liang and Robert Aldridge. Their 25th anniversary celebrated Chen Yi’s From the Path of Beauty, commissioned with Chanticleer and Penderecki’s String Quartet No. 3. From the Path of Beauty, premiered in San Francisco, with performances at Tanglewood and Ravinia, Beijing and Shanghai. Other recent premieres include works by Bright Sheng, Zhou Long, Du Yun, Zhao Lin, and William Bolcom. This tradition continues with forthcoming works by Wang Lei and Tan Dun composed for the quartet’s 35th Anniversary in 2018–19. The Shanghai Quartet has an extensive discography of more than 30 recordings. Highlights include Chinasong, Chinese folk songs arranged by Yi-Wen Jiang, and the complete Beethoven String Quartets on the Camerata label. Other media projects range from an appearance in Woody Allen’s Melinda and Melinda, to PBS television’s Great Performances. Weigang Li appeared in the documentary From Mao to Mozart: Isaac Stern in China, and the family of Nicholas Tzavaras was the subject of the film, Music of the Heart. The Quartet is the subject of a documentary film, “Behind the Strings,” currently in production. The Shanghai Quartet perform on four exceptional instruments by Goffriller, Guarneri, and Stradivari, generously loaned through the Beare’s International Violin Society. To honor the quartet’s 35th Anniversary. the Shanghai Quartet is Quartet-in-Residence at Montclair State University, Ensemble-in-Residence with the Shanghai Symphony Orchestra, and visiting guest professors of the Shanghai Conservatory and the Central Conservatory in Beijing. They are sponsored by Thomastik-Infeld Strings, and BAM cases.